Welcome to the second cluster of this journey in the world of tabla. This is perhaps one of the most common and most interesting sections. In the previous unit, we talked about the alphabet and sounds of tabla. The fundamental bols and sounds very important for tabla will be used together to make rhythms and many interesting elements. In Indian music, generally, there are three elements. The elements are the melody, drone, and the rhythm. The melody is provided by an instrument of the sushir vadya (blown air), tantri vadya (plucked stringed instruments) and vitat vadya (bowed instruments). These three instruments have the ability to play Indian melodious modes known as ragas. A simple definition of raga provided here can never do full justice to define what a raga really is. It is recommended that one visit the KKSongs Ragamala for finer aspects. The second element is the drone. The drone is a simple note held constantly. The function of the drone is to help provide a constant pitch. This helps vocalists find their tonic. Drones are found in instrumental music either by a drone instrument or in the melody instrument itself. The tanpura and sruti box are the most commonly used instruments to act as drones. The final element is the rhythm. The proper word for rhythm is tala. This comes from the Hindi word, “tali” meaning “clap.” This provides the time when the raga is played. Tabla is a tala episode. Pakhawaj, mridanga, khol, and dholak are other instruments used to keep tala. As this is a course in tabla, talas will be our primary focus. Western music tends to describe rhythm in measures. For instance, every measure in a song can have four beats. In Indian music, we describe rhythm as cycles. A piece can be in a rhythm of sixteen cycles. Let us examine the elements of the tala. The tala can be viewed best as a unit circle read clockwise. The beginning of the circle indicates the start of the cycle. Each cycle has beats. The Indian word for beat is matra. A cycle has a fixed number of matras. The first matra indicating the start of the cycle is known as the sam. 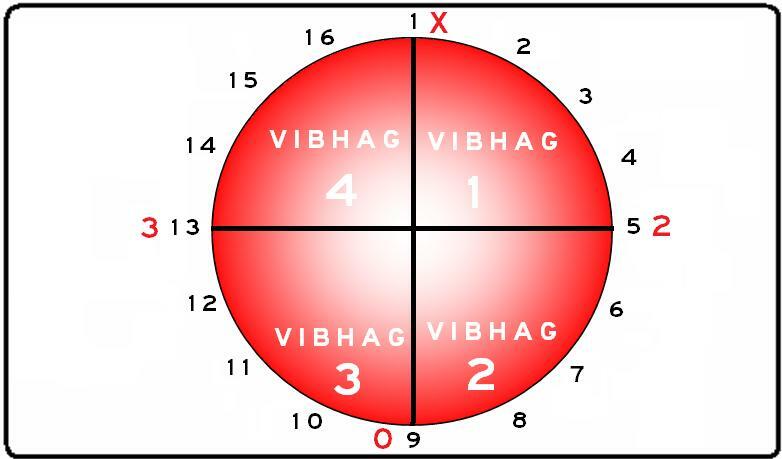 By convention, the sam is represented by an “X.” The circle is thus divided by measures called the vibhag. The Western concept holds each measure bearing an equal number of beats. Vibhags, on the other hand, may or may not hold equal numbers of matras. Notice on Figure 6.1, the unit circle. Assume there is a sixteen matra tala. Notice at matra 1, the “X” representing the sam is indicated there. Since there are sixteen matras, and four vibhags, we can assume that each vibhag has four matras. 1+4=5. Matra 5 starts the second vibhag. 5+4=9 Matra 9 starts the third vibhag. 9+4=13. Matra 13 begins the final vibhag. After matra 16, the cycle repeats. One completed cycle is known as an avartan. When we discuss the vibhag nature of this tala, we say, “This tala is divided 4-4-4-4.” This set of numbers is called a vibhag division or tala division. This means the first vibhag is four matras, the second is four matras, the third is four matras, and the fourth is four matras. If you add each of the matras up, you should end up with the total number of matras in the cycle. In this case, 4+4+4+4=16 matras. Other possible divisions could be 6-4-2-4. This is also four vibhags, but the first vibhag has six matras, second having four, third having two, and fourth having only four matras. Add 6, 4, 2, and 4 together and you also get sixteen. This means that the divisions occur at sam, matra 7, matra 11, and matra 13. Therefore, just because it has four vibhags with sixteen matras does not imply four matras in each vibhag. On Figure 6.1, there are numbers 2, 0, 3, and “X.” These are accent numbers. Generally, the sam is the matra with the highest accent. This is thus, indicated with an “X.” The number 2 and numbers after 2 represent stress or accents. These are called accent numbers. The accent number 2 and accent number 3 do not represent weight or the amount of stress. The accent numbers simply represent position. Shown on Figure 6.1, accent number 2 is placed on matra 5. This denotes matra 5 having an accent. Similarly, accent number 3 is placed on matra 13. This means that matra 13 has an accent. If a matra contains a zero, this denotes that the matra has no accent. In this case, matra 9 has no accent. When you actually recite the tala using claps and waves, and then play the actual tala on tabla, it is very amazing to see how similar the clap-wave notation and the actual tabla sounds. When describing talas in the future, the clap-wave method will be described along with the tala. Some artists, to emphasize the number of bols, will count based on accumulating matras. For instance. “CLAP 2, 3, 4, CLAP 6, 7, 8, WAVE 10, 11, 12, CLAP 14, 15, 16”. This works too. Either way serves the purpose of keeping accents, vibhags, and matras per vibhag in tact. Tisra jati means that the tala has a cycle with a multiple of three matras. Catastra jati means that the tala has a cycle with a multiple of four matras. Khanda jati indicates a multiple of five matras. Misra jati indicates a multiple of seven, and a rare jati, sankirna, indicate a multiple of nine. A tala with nine matras, even though it is a multiple of three, has a higher priority with nine. Usually, a number with multiple choices for jatis would opt for a higher jati. The only exception is twelve matra talas. Prime number talas are named to the nearest jati. For instance, an eleven matra tala is classified as a khanda jati, since ten, a multiple of five, is the closest. The tala used in Figure 6.1 is catastra jati. Be sure to understand these concepts very well. These will be used very extensively in our development of building tala knowledge.